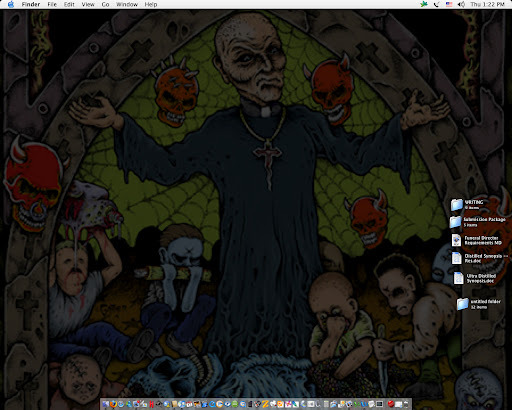 Steve tagged me for a screenshot of my desktop. Figuring I’d forget it completely if I didn’t do it now, here it is. We just changed to this image a few days ago. Before that it was a spray-painted wall that said, “Please F**k the System, Thank You.” This one is much cooler (and eeevil). Anyway, there’s not much going on in the file area because I store everything not immediately necessary in my desktop folders (we’ve already gone over the fact I’m neurotic, right?). All I have up is my agent submissions folder, a document on funeral director requirements for Maryland, a couple catch-all, temporary folders for the day’s writing and two drafts of my one-page synopsis. At the bottom is the toolbar for the things I use most: desktop folders, Firefox, mail, Word, Sherlock, address book and Messenger. The rest is either system software I’ve never paid attention to or is part of the Architect’s domain that I don’t mess with. My trash is full, as always, since I’m always afraid I’ve thrown away something I might need later. This entry was posted on Thursday, September 27th, 2007 at 5:29 pm	and posted in meme, screenshot, tag. You can follow any responses to this entry through the RSS 2.0 feed. I’m feeling less alone with my own odd ways of filing and refiling, and making new folders just for something very specific. That image is scary, I love it! Steve — You’re welcome. The fact yours is messier probably indicates you’re much more mentally balanced than I am.Charles — I have to admit the Architect found it. I think it’s album artwork. I love that image, man.